The procedures outlined in this sheet should be performed by a skilled technician. Refer to the appropriate service manual for instructions on checking tappet clearance and selecting the proper shims for tappet clearance. Valve adjustment tool, P/N 5034226, allows for quicker and easier removal and replacement of the tappet clearance shims used on the 40/50 and 90/ 115/140 4-stroke outboards. 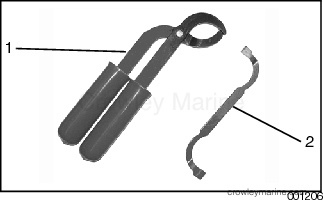 Note this tool replaces tappet holder, P/N 345832, previously specified for the 40/50 outboard. To prevent accidental starting while servicing, disconnect battery cables at the battery. IMPORTANT: Refer to the appropriate service manual for instructions on checking tappet clearance and selecting the proper shims if tappet clearance adjustment is required. Rotate the crankshaft until the high point of the camshaft lobe is 180 degrees away from the adjustment shim that is to be replaced. IMPORTANT: Rotate the 40/50 crankshaft clockwise. Rotate the 90/115/140 crankshaft counterclockwise. The water pump impeller can be damaged if the crankshaft is rotated in the wrong direction. 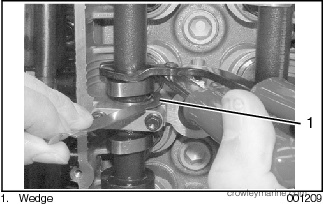 Rotate the valve tappet until the shim access notch is facing the center of the cylinder head. The notch provides access to remove the shims with forceps. 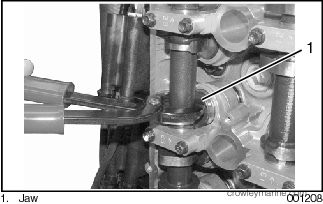 Place the valve depressor tool over the camshaft with the longer jaw between the camshaft and tappet. The ends of the jaws will be pointing toward the outside of the cylinder head. Squeeze the valve depressor tool handles and rotate the depressor handles toward the center of the cylinder head to completely depress the tappet. IMPORTANT: The tappet must be fully depressed before inserting the tappet wedge. The tappet must be below the top of the tappet bore. 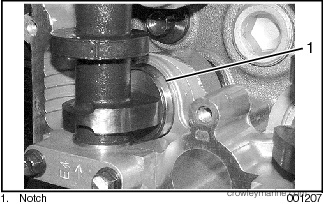 Position the tappet retainer wedge between the outer rim of the tappet and the camshaft to hold the tappet depressed. Remove the compressor. IMPORTANT: When placing the wedge on the edge of the tappet, make sure the tool is not touching the adjustment shim. If touching, the shim cannot be removed. The wedge has a different shape on each end to fit between the camshaft holder and the upper and lower tappets of each cylinder. Use forceps or pliers to remove the shim. 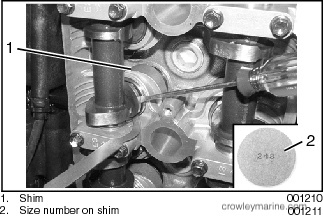 Read the size number or measure the shim’s thickness. 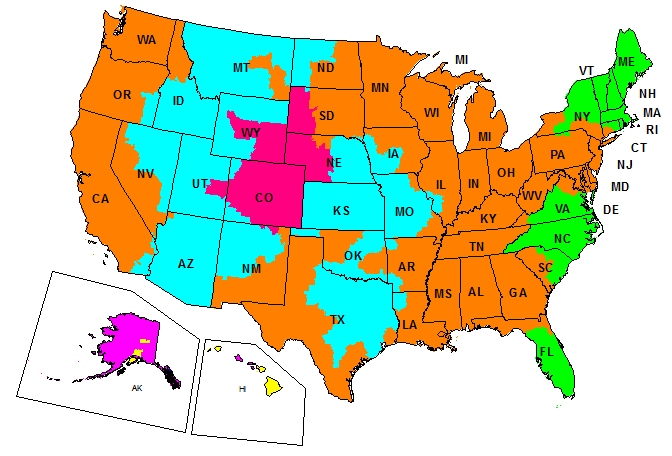 Use the shim selection table in the service manual to chose the correct replacement shim. IMPORTANT: Install the replacement shim with the size numbers facing the tappet. This reduces the possibility of the numbers wearing off the shim. Apply clean oil to the shim so it will adhere to the tappet during installation. After installing the replacement shim, use the depressor to depress the tappet and remove the wedge. Rotate the engine one full revolution and verify the valve lash is correct. Repeat this procedure for the other shims that must be replaced.